Screen Services StaticCatch Resin Traps (media traps) using wedge wire screen placed inline provide effective protection against media losses. In many systems, a failure can allow media to escape from the treatment vessel. Not only is the lost media expensive, damage to downstream pumping equipment can add to the expense. 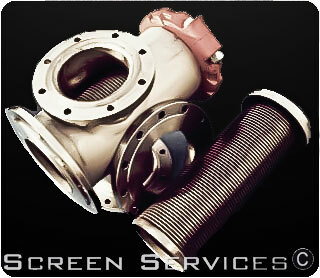 A Screen Services StaticCatch resin trap incorporates a screen element which is easily removed for servicing or cleanout after a vessel upset; the access flange can be standard ANSI bolt-up or Victaulic® type, as preferred. Screen slot openings are typically 0.25mm (0.010") using #60 wedge wire, providing over 14 percent free screen area. For heavier applications, (i.e. extreme line pressure) #69 wedge wire can be used, which will provide 12.5 percent open area with 0.25mm slot openings. Typical materials of construction would be type 304 or 316 stainless steel for the screen element and the housing, or for severe conditions, we suggest that a high nickel alloy such as C-276 be considered throughout. Optionally, in less severe environments, carbon steel may be chosen for the housing and connection flanges, with coating of the interior of the housing with epoxy an additional option. There are four models available. The Spool Piece Inline is the simplest and least expensive, but has the greatest flow restriction and the smallest trapped media capacity. 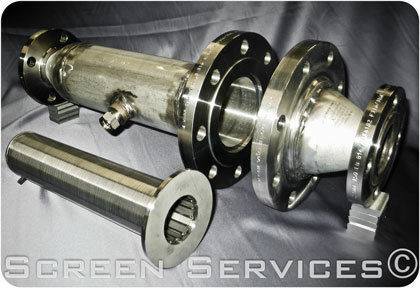 The Split-body Full-bore Inline provides lower pressure losses and superior capacity. The T-body Full-bore model provides the benefits of the Split-body with easier screen element access, but does require more complex piping arrangements. The Y-body Full-bore Inline unit provides all the benefits of the T-body whilst keeping piping arrangements simple, but is also the most expensive. For more information, please download our Collectors (298K) brochure (Adobe Acrobat format). For a quotation, please download, fill in, and send us a copy of our StaticCatch Quote Request (101K) form (Adobe Acrobat format).